Bodemeister stamped his Kentucky Derby 2012 ticket with a facile 9-1/2 length triumph over stablemate Secret Circle in Saturday’s Grade 1 Arkansas Derby at Oaklawn Park. Bodemeister broke outwardly from post 11 but quickly straightened himself out and set sail for the lead under Mike Smith, carving out splits of :23.02, :46.55, and 1:11.36. The Bob Baffert trainee increased his advantage at every call and opened up by two lengths after six panels. Stat started to give up the chase after six furlongs and it was Secret Circle’s turn to make his move. The G3 Southwest/G2 Rebel hero was clearly second at this point but Bodemeister was more than three clear after a mile in 1:36.74 and cruised across the line more than nine to the good, stopping the clock in 1:48.71 and paying $6.80 as the post time favorite. Secret Circle might have distance limitations but he always fights hard to the end and would not let Sabercat and Cozzetti pass him for 2nd. Baffert’s runner-up has fired Exacta shots in all seven lifetime starts. I have been a fan for quite some time but do not consider him a viable ten furlong threat on the first Saturday in May. Sabercat punched his Derby ticket last November when he captured the $1million, G3 Delta Jackpot. He flopped in his Rebel return and showed some late interest to garner the show on Saturday. He is not good enough to win the Derby but has earned the right to participate based on the rules. Atigun finished 5th and was followed by Stat, Najjaar, Isn’t He Clever, Optimizer, Jake Mo, and Raconteur. As for Bodemeister, he put it all together in Hot Springs but I do not like his chances under the Twin Spires. The unraced juvenile may have peaked at Oaklawn Park and I cannot see him running the same race in three weeks. Yesterday’s win reminded me of his maiden tally and after that effort he returned in four weeks to lose to Creative Cause in the G2 San Felipe. Note that he romped the two times he grabbed the early lead and he finished 2nd both times he failed to clear off early. For final time comparison purposes, Alternation won the G2 Oaklawn Handicap for older horses earlier in the day and completed his nine furlong journey in 1:49.94. 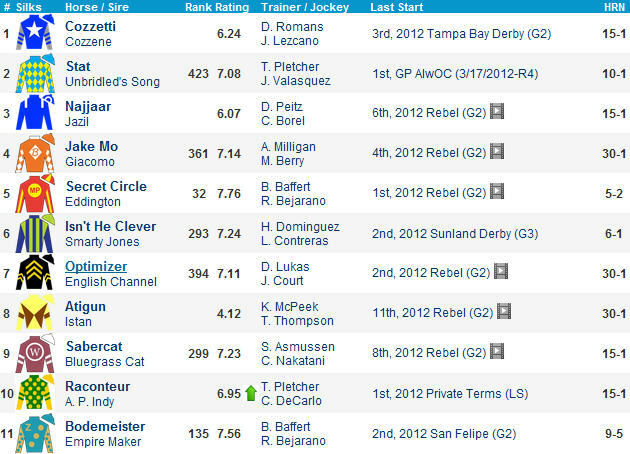 Arkansas Derby 2012 Preview: Bodemeister or Secret Circle? The Oaklawn Park 3-year-olds take their final steps toward Kentucky Derby 2012 in Saturday’s G1 Arkansas Derby and Bodemeister and Secret Circle share top billing for trainer Bob Baffert. #11 Bodemeister is the 9-5 morning line favorite. The unraced juvenile landed the place in his Santa Anita sprint bow before romping in a fast flat mile graduation run Feb 11. He gave his all but could not quite match strides with Creative Cause in the G2 San Felipe March 10, and he was hardly disgraced in a fine runner-up performance. He removes the hood and figures in the thick of things throughout under Mike Smith. #5 Secret Circle (5-2) has fired Exacta shots in all six lifetime starts and is 2-for-2 at Oaklawn Park. The hard knocking early-pressing type may have reached the end of his stamina rope but must be respected throughout under Bejarano. #3 Najjaar (15-1) is an interesting late runner for profitable dirt route trainer Dan Peitz. He fell too far back under Borel in the G2 Rebel and showed late interest while splitting the 12-horse field. He is reportedly training well for this and can make a serious late run if he is able to maintain contact with the field. #2 Stat (10-1) has raw talent for Todd Pletcher. The early-pressing type reminds me a bit of Dance City, who landed the show for this barn in last year’s Arkansas Derby. #6 Isn’t He Clever (6-1) almost stole the candy in the G3 Sunland Derby but he moved a bit too soon under Contreras. He would probably be a slam dunk if this race was in New Mexico but looms a tactical threat nonetheless. Albarado hops aboard. #1 Cozzetti (15-1) put in a late run to garner the show in the G2 Tampa Bay Derby last time. He appears capable of landing the show for Dale Romans but a win would surprise. #4 Jake Mo (30-1) has danced all of the local dances (Smarty Jones, Southwest, Rebel) and was not disgraced in any of those events. He can compete for a minor award at a big number. #7 Optimizer (30-1) rallied for the place in the Rebel but that was his sixth straight loss on conventional dirt. Court got to know him last time but Lukas struggles in graded races (2% wins, 154-race sample) and this one is better on synthetic/turf. #9 Sabercat (15-1) won a slow renewal of the G3 Delta Jackpot as a juvenile and predictably flopped while overbet in his Rebel return. He can spring forward 2nd off the shelf but is not fast enough to threaten these. #8 Atigun (30-1) is training forwardly and has seemingly gotten rid of his pesky quarter crack. He adds lasix and should improve off his 11th place Rebel finish. #10 Raconteur (15-1) exits a game win in the $75k Private Terms Stakes but was dusted in his lone graded try (Gotham) and is a few notched below the best in here. I began grading the Kentucky Derby 2012 preps with the Breeders’ Cup last November and the BC Juvenile has turned out to be quite a productive race. I gave the BC Juvenile a B grade, which was my highest ranked 2-year-old Derby prep of 2011. The race did not earn a triple digit speed rating but I liked the looks visually and thought there were numerous well bred prospects capable of making noise on the Derby trail including Union Rags, Creative Cause, and Alpha. So far, I have graded 29 Kentucky Derby preps, beginning with the BC Juvenile Sprint (11-4-11) through the Rebel Stakes (3-17-12). 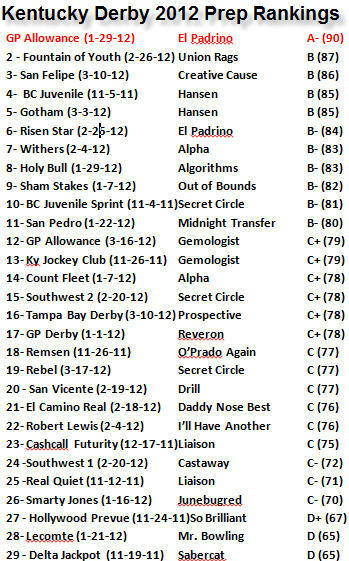 The next phase of Derby preps stretch the stamina limits to nine furlongs so I thought this was an appropriate time to rank the aforementioned 29 Derby prep races. I graded each prep along the way like a teacher, using the A-B-C-D format. For ranking purposes, I have included a number with the letter grade. For example, 100 is the highest number possible, an A+ perfect prep. A 60 or D- is the lowest possible grade. In the chart below, El Padrino‘s allowance win at Gulfstream Park in January received an A- grade or 90, which is my highest ranked race on the Derby trail up to this point. The Delta Jackpot is ranked lowest with a grade of 65. How did I come up with the rankings? I considered speed figures, strength of competition, and visual impressions, which helped me compile the rankings below.